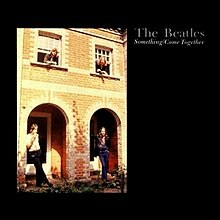 "Something" is a song by the Beatles, featured on their 1969 album Abbey Road. It was released that same year as a double A-sided single with another track from the album, "Come Together". "Something" was the first Beatles song written by lead guitarist George Harrison to appear as an A-side, and the only song written by him to top the US charts while he was in the band. The single was also one of the first Beatles singles to contain tracks already available on an LP album. John Lennon and Paul McCartney, the band's principal songwriters, both praised "Something" as one of the best songs Harrison had written, or that the group had to offer. As well as critical acclaim, the single achieved commercial success, topping the Billboard charts in the United States and making the top five in the United Kingdom. The song has been covered by over 150 artists, making it the second-most covered Beatles song after "Yesterday". Artists who have covered the song include Elvis Presley, Frank Sinatra, Ray Charles, James Brown, Shirley Bassey, Tony Bennett, Ike & Tina Turner, the Miracles, Eric Clapton, Joe Cocker, Isaac Hayes, Julio Iglesias, Mina and Phish. Harrison is quoted as saying that his favourite version of the song was James Brown's, which he kept in his personal jukebox. George Harrison play the slide guitar on this tune and I was driving and I remember how I was so taken in by his guitar work. A mellow tune to be sure.